Egypt's presidency spokesman Bassam Rady said on Sunday that Cairo is committed to a peaceful course in negotiations on the Grand Ethiopian Renaissance Dam (GERD), though he reiterated that Egypt’s supply of Nile water is "a matter of life or death for the country." "Egypt took a direct path in the negotiations, based on honesty, friendliness and mutual relations. We are still committed to this path," Rady told Ahram's Arabic news website. The latest tripartite ministerial meeting between Egypt, Ethiopia and Sudan held in Cairo last November to discuss a preliminary technical report on the impact of the dam had failed to reach a consensus. On Thursday, Egyptian Foreign Ministry Spokesman Sameh Abu Zeid said that Foreign Minister Sameh Shoukry is set to visit Addis Ababa next week to discuss specific ideas to overcome the stalemate in the GERD technical negotiations. Abu Zeid stressed in last Thursday's statements Egypt’s keenness to resume talks on the GERD technical negotiations as soon as possible, saying that Cairo is currently assessing if the stalemate is "intentional," or due to differences in points of view on issues between Egypt and Ethiopia. The spokesman said that there are disagreements on the report issued in October 2017 by the European firms tasked with assessing the impact of the dam on downstream countries. 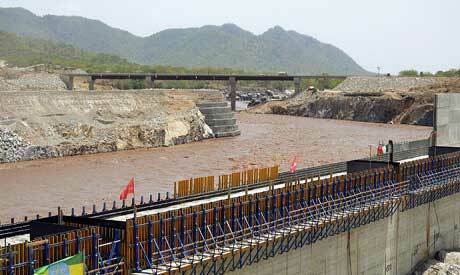 Ethiopia has been constructing the Renaissance Dam since 2011 on the Blue Nile. Egypt has repeatedly voiced concerns that the dam would reduce its share of Nile water, which currently stands at 55.5 billion cubic metres per year in accordance with a 1959 treaty. In October, the Ethiopian government announced that the construction of its 6,450 megawatts dam was 62 percent complete. During their last meeting in New York on the sidelines of the United Nations’ General Assembly in September, Shoukry told his Ethiopian counterpart Workneh Gebeyehu that Cairo is concerned about the slow progress of technical studies on the dam. The Egyptian foreign minister expressed Egypt's concern about the inactivity of the tripartite technical committee assigned to study the effects of the dam on downstream countries.